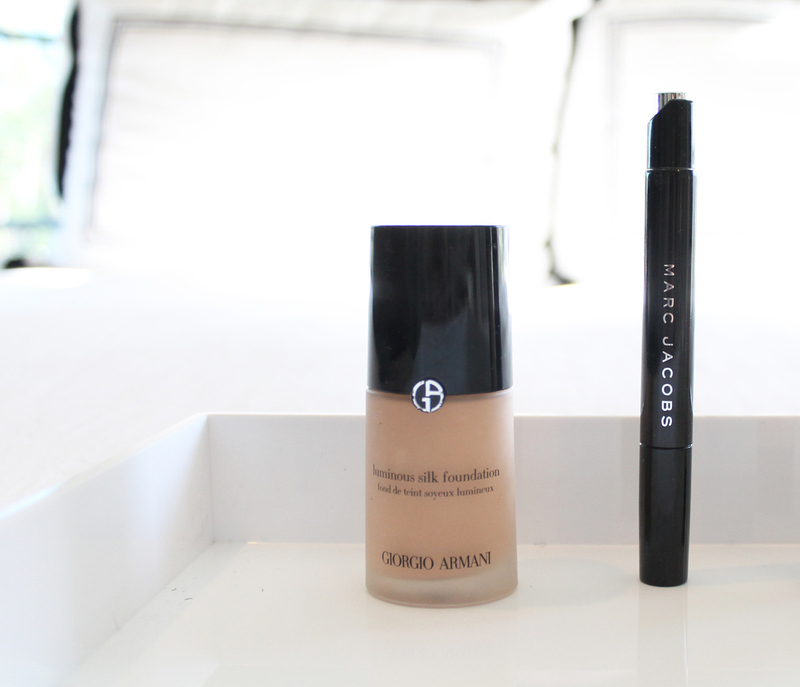 For my base, I really love Giorgio Armani's Luminous Silk Foundation, which is a cult favorite amongst beauty bloggers and make-up artists alike. It's light and silky, and goes on easily (I apply it with just my fingers). It blends into your skin really well, and actually looks...like skin! It's very light coverage, so on shoot days, I'll add on another layer for a bit more coverage. It's the perfect choice for a natural, dewy look. Another product in my base arsenal is the Marc Jacobs Remedy Concealer Pen, which I use under my eyes and on any spots/red marks I may have. It's a good medium coverage foundation, blends well, and is never cake-y. I really wanted a liquid concealer that had good coverage and didn't settle into my dry spots, and this really does the trick. The rest of the steps in my make-up routine are also quick and painless. I like to apply a little highlighter to bring out my features-- it's a quick and easy way to add a bit of polish to the minimal make-up. Currently, I'm using the Touch in Sol Light Bright Brow Spot Highlighter, which is ok. I like the cream form and it goes on easily and highlights well, but its a bit sparkly for my taste. Feel free to comment below if you have any good highlighter suggestions! Another easy, quick way to polish up your look is with a bit of brow gel. I like to use Benefit's Gimme Brow Volumizing Gel and just do a quick sweep over my brows in the morning, which helps brush them out and keep them in place, giving me those highly coveted Cara Delevigne brows. I've always believed that, when it comes to make-up, mascara is an everyday must. It really polishes off your look. I've been using L'oreal's Extra Collagen Mascara in Black for years and I honestly think it's the best deal out there. For $7, I get the best lashes of my life (yes, even better than those fancy $40 designer mascaras).